There is nothing written on the back of the print but Norman suspects that it is somewhere on the North London line. This is Birmingham New Street no. 1 signal box seen from the London end of platform 1. 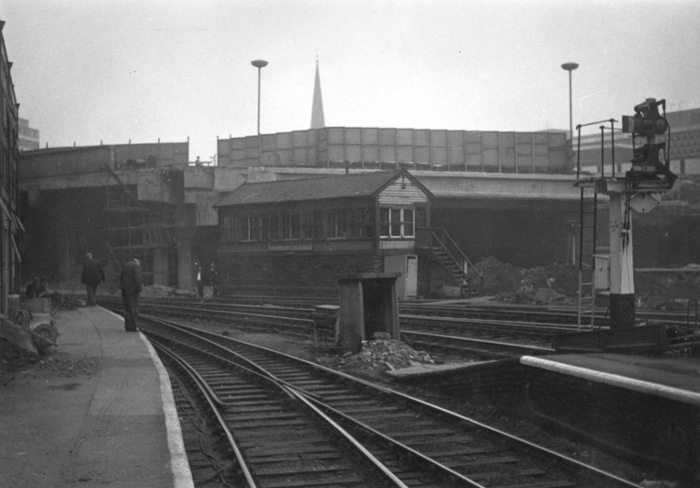 The photograph appears to have been taken in the period between Stage 1A and 1B of New Street re-signalling (January 8th to 24th 1966). At the start of Stage 1A nos. 1, 2 and 5 boxes were taken out of use and the new signalling brought into use for platforms 6 to 12 only, a new signal can be seen on the right of the picture. The semaphore signals at the ends of platforms 2 and 3 were fixed at danger and up trains only were hand-signalled through these platforms, platform 1 was used as an engineers siding. East end of Birmingham New Street? I cannot identify the location but I don�t think this can be on the North London Rly. as the cabin is an LNWR type 4, which had ceased to be made before the LNWR became involved with the NLR. As far as I am aware all LNWR-pattern cabins on the NLR were Type 5 (and usually placed in LMS days). The cabin is Type N, 44ft 0in in length and nominal 70 levers � quite a large cabin, and according to Richard Foster�s book only 23 of this type existed, which ought to narrow things down a bit. The name on the fascia board seems to be quite short � say 10-12 letters. Perhaps Richard can tell us the answer. Could it be (Birmingham) New Street No.2? This looks very much like the London end of Birmingham New Street station taken from one of the South Staffordshire bay platforms. The spire of Saint Martin's Church, situated in the Bull Ring, can be seen against the skyline. The date circa1963, as the bridge looks newly constructed, I assume this bridge continued to carry Worcester Street across the line, as did its predecessor. Yes, agreed, London end of Birmingham New Street. I remember standing on a platform end near that box and seeing an LMS Jubilee blasting out into the tunnel. Quite a sight and sound!